Super Eurobeat presents JGTC (Complete Series), Complete JGTC Collection Thread. Only need JGTC Special 2002 -Second Round- to finish the series. I will acquire the album very soon. Do you have any of those album physically? I only have GT 2008 -First Round- and, if you have some physical release, would you mind uploading the albums in any lossless format? If you don't I'll be just grabbing the MP3s then... it's not like I'll listen to them anyway; I'm just trying to get the best for collection sake. All the albums I've posted (except 2009 1st round,2008 2nd, and JGTC 2003) are albums that I physically own. Because you requested it (you also put 2008 1st round in Lossless) I will put the final release in Lossless format. JGTC 2002 2nd round is the LAST Super Eurobeat album that I will be sharing. You will post the last one in lossless. Thanks! But I think you miss the opportunity to leak all those rare albums in lossless in the wild. Maybe you could start a torrent... I would seed that for a while. All the GTC, JGTC, and SuperGT albums are here except this one. This will complete the collection, after looking at Eurobeat Prime's database. I have a question regarding the Super GT 2005 albums, why do I only see a big sized mp3 file inside the .rar archive? How do I use these for me to see the individual tracks? If it also contains a .cue file you can use that to split the MP3 with a CUE splitter. Otherwise, whoever created the source was an idiot. Wow, thanks alot everyone for the shares! I've got all JGTC except 2007 Special Round disc 2. If anyone needs any I can upload them (all cues or files). 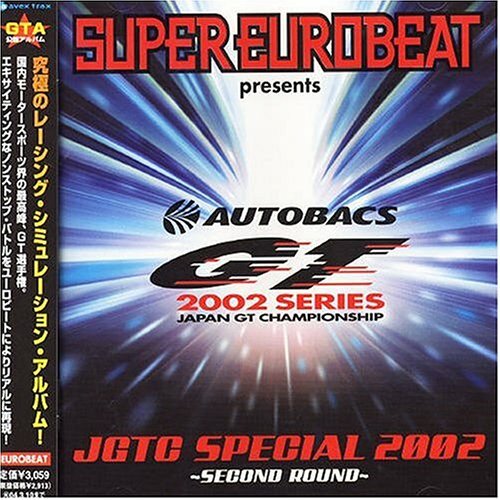 Edit: Anyone with Super Eurobeat presents JGTC Special 2002 -Second Round- in MP3 version? Please? Wow, Super GT 2008 -First Round- is off the hook! Could you upload it again ? I'll see if I have it. Does anyone have Super GT 2007 2nd Round? The one posted by EmilianoGT doesn't have the real extended version of Loveline by F.C.F. There is no extended version, its a megamix. Sorry for bumping and old thread but did anyone get JGTC 2003 Round 2? Link is long dead. Thanks in advance. Let's not pretend that every JGTC album shouldn't just be "Overload" and "The Road is on Fire" repeated over and over again.